Solution providers offer simulation tools that help retailers try things out in a virtual environment before trying them in the real world. JDA 3D and Impinj SPS are good examples. Trial and error is a painful and expensive way to learn. We have all learned from the school of hard knocks when something doesn’t turn out the way we envisioned. In business, these mistakes can have devastating financial and career consequences. So, there is significant value in technologies that help us try things out virtually first – playing ‘what if’ in ways that closely simulate reality, without having to actually make those mistakes in real life. I briefly discussed one such technology, JDA 3D, in my article last month on JDA Focus 2012. Through their partnership with Red Dot Square, JDA 3D displays a photorealistic 3D simulation of the actual store, based on the blueprint and planogram that the retailer provides, plus photorealistic 3D renderings of the products, all displayed on life-sized high definition screens. In fact, one retailer even made a life-size, walk-in simulator with wrap-around displays. It really feels like you are in the store. 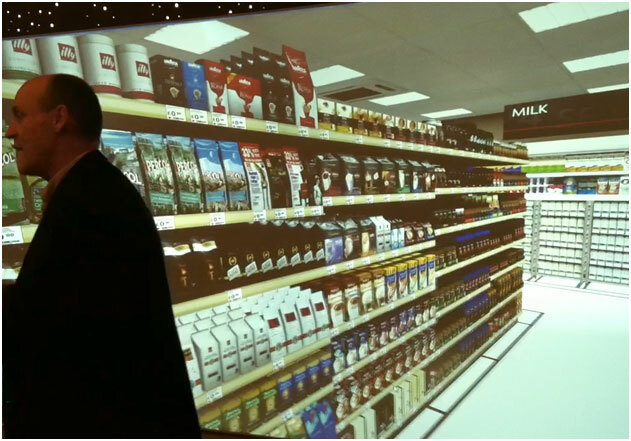 Among other uses, this lets store planners, assortment planners, and architects try out different store layouts, fixtures, and planograms in a virtual space, without all the expense and commitment of doing it in a real store. As one executive at a major retailer said, “With this capability, I can fail cheaply.” Concepts can be tried out behind the scenes, without turning off and potentially losing customers, or alerting the competition to what the retailer is trying to do. Another good example is Impinj’s Store Performance Simulator (SPS), announced last month and demoed in a webinar last week (you can see it here). 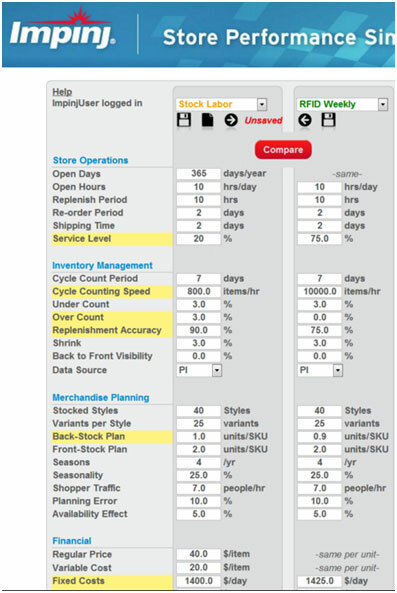 The simulator allows retailers to create and compare different store scenarios changing over 25 various parameters characterizing the simulated store such as: hours/day and days/year of store operation, replenishment and reorder periods, service levels, frequency of cycle counting, counting accuracy, rates of shrink, number of styles stocked, number of variants per style, impact of seasonality, shopper traffic levels, average forecast/planning error rates, average item price and variable cost, fixed costs, and so forth. 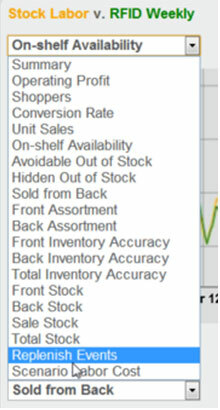 Thus a retailer can model a reasonable simulation of one or more of their stores in an “as is” scenario. Now they can play ‘what if’ by changing one or more parameters to create a second scenario. “What if we increase the frequency of our cycle counts? What if we reduce forecast errors? What if we switch to using RFID? What if we increase or decrease the number of styles we are offering, or the average selling price?” The tool highlights the differences between the two scenario definitions in yellow (see Figure 2, right). The SPS tool allows the user to compare the two scenarios', outcomes side-by-side. This is includes a summary of key performance metrics such as units sold, labor costs, and operating margins (see Figure 3, below). For example, Figure 5, below, shows the comparison of two different RFID scenarios. 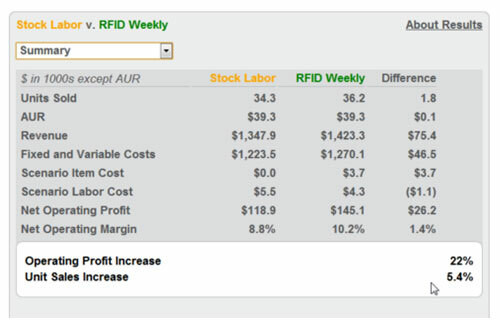 The “RFID Weekly” scenario is where store associates do a physical inventory cycle count once a week,2 using mobile RFID readers. The “RFID Centerpoint” scenario simulates the retailer having mounted RFID reader(s) between the back and front store, so that it counts all items going from the back store to front of the store and vice versa. 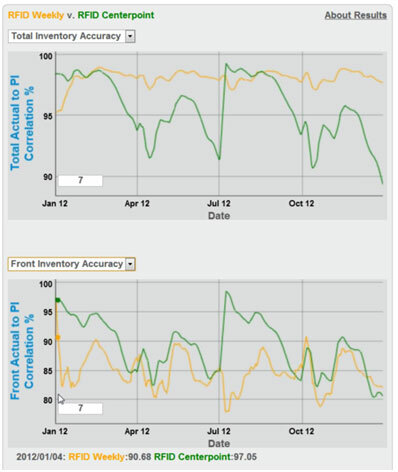 Figure 5 shows that the weekly cycle counting scenario maintains a higher overall perpetual inventory (PI) count, whereas, the Centerpoint scenario tends to have better front store inventory accuracy, in part because it is closer to “real-time” than the weekly count. You’ll notice at the beginning of each week, that the “RFID Weekly” scenario catches up, but then starts to drift in accuracy. From these types of comparisons, retailers can really start to figure out what is going on, and what will be the impact of changes they are considering. Impinj says that the major retailer they have been piloting with compared SPS’s predictions and found them to be quite close to their actual real life measured outcomes. It was apparent to me from the demo that this tool is not a prototype – it has been field tested and refined based on customer feedback. Unlike JDA, Impinj is not a software firm, but rather a hardware company. They sell chips for UHF RFID tags and readers, RFID antennas, reader hardware, and the like. So their primary motive in creating SPS was not to sell that piece of software. Rather, Impinj needed a way to realistically and convincingly show retailers the benefits of implementing RFID in their stores, without the retailer having to incur the expense and hassle of doing an actual pilot with all of the hardware, installation, not to mention the disruption and labor costs of having to tag all of the items for the pilot, and so forth. Clearly SPS is targeted at bolstering and shortcutting the sales cycle for Impinj and their channel partners. But it also provides significant value to retailer prospects and customers beyond just considering the impact of an RFID implementation. It helps retailers really explore a host of different scenarios and gain insights that would be too difficult or too expense to get by trial and error. It allows Impinj to have a really substantive and meaningful dialog with the retailer and be seen as a partner that can add value beyond just selling RFID products. I imagine it changes the dynamics of the relationship between Impinj and the retailer. That has to be good for Impinj … and their retail customers. 1 FYI, the ’real person’ in this picture happens to be Mark Edwards, Chairman of Red Dot Square, JDA’s partner who developed the 3D technology used in JDA 3D. I took this picture at Focus 2012 where I met Mark. 2 With RFID, the retailer can afford to do weekly cycle counting because the speed of counting inventory with RFID has been shown to be about 20X (or more) faster than normal manual counting methods.